I'm a marketer by trade, and I spent a lot of time considering the name that I wanted to attach to my message. And I chose Reformation500 for its ability to be meaningful in our time, while at the same time focusing on one of the greatest events in history. Schaff, "History of the Christian Church," Volume 7, § 1. The Turning Point of Modern History. The Reformation of the sixteenth century is, next to the introduction of Christianity, the greatest event in history. It marks the end of the Middle Ages and the beginning of modern times. Starting from religion, it gave, directly or indirectly, a mighty impulse to every forward movement, and made Protestantism the chief propelling force in the history of modern civilization. The age of the Reformation bears a strong resemblance to the first century. Both are rich beyond any other period in great and good men, important facts, and permanent results. Both contain the ripe fruits of preceding, and the fruitful germs of succeeding ages. They are turning points in the history of mankind. They are felt in their effects to this day, and will be felt to the end of time. They refashioned the world from the innermost depths of the human soul in its contact, with the infinite Being. They were ushered in by a providential concurrence of events and tendencies of thought. The way for Christianity was prepared by Moses and the Prophets, the dispersion of the Jews, the conquests of Alexander the Great, the language and literature of Greece, the arms and laws of Rome, the decay of idolatry, the spread of skepticism, the aspirations after a new revelation, the hopes of a coming Messiah. The Reformation was preceded and necessitated by the corruptions of the papacy, the decline of monasticism and scholastic theology, the growth of mysticism, the revival of letters, the resurrection of the Greek and Roman classics, the invention of the printing press, the discovery of a new world, the publication of the Greek Testament, the general spirit of enquiry, the striving after national independence and personal freedom. In both centuries we hear the creative voice of the Almighty calling light out of darkness. The Reformation was like a big chiropractic "adjustment" on the back of the Body of Christ. It straightened out things that had really gotten out of whack. Certainly there was resistance to it. The church had developed many problems, and it had become complacent in many ways. Those are all certainly worth exploring, but I think it is very important these days to bring to the front some of the most positive aspects of the Reformation. James has spent a good bit of time tracking down and setting straight many of the things falsely attributed to Martin Luther. But to put it into perspective, Steven Ozment, the Harvard historian who believes that the Reformation was ultimately not successful, nevertheless believed that Martin Luther was the "most brilliant theologian" of the Reformation era. "He led the revolution against Rome and traditional religion not as a visionary spiritual reformer, but as a skilled doctor of theology." (Steven Ozment, "Age of Reform, 1250-1550: An Intellectual and Religious History of Late Medieval and Reformation Europe" pg. 231). The date, October 31 1517, is a kind of anchor point by which we remember the beginning of the Reformation. Our minds naturally look to these "anchor points" as a way to remember things. For me, history has been a framework on which to hang the knowledge of more substantial doctrines that developed over the centuries. And I think that 500 years is a nice round time-frame to look back on an anniversary. But from the dates that Ozment gives, Luther himself was already fully involved with the course of study that would lead him to the momentous events of the next decade. Reformation Day, as we know it, is misleading. It creates the impression that the Reformation was about "cleaning up" the church. It wasn’t. There were moral reform movements about in the late middle ages and early 16th century but the Reformation wasn’t one of them. The Reformation was a theological event that was intended to have moral consequences, but it wasn’t first of all about moral self-improvement and tidying the ecclesiastical house. Beware all the various “Reform” movements in our churches today that want to turn the Reformation into moral renewal (and that’s most of them). Beware when folk invoke a "new" Reformation who don’t understand the old one. Beware when folk call for a Reformation that requires a repudiation of the first Reformation. Those movements abound. Reformation Day, as we know it, perpetuates the pietist myth that the Reformation happened suddenly and in one-fell-swoop of religious experience (the so-called Turmerlebnis). It wasn’t and it didn’t. The Reformation doctrines developed gradually between 1513-21. In succession, and with fits and starts, Luther gradually realized the great Reformation solas. There are some Reformation solas with which we’re not all familiar. Luther’s first breakthrough happened during his lectures on the Psalms when he realized that Scripture teaches that we’re not just a little sinful but that we’re completely sinful, i.e., that the effects of sin are radical and affect every faculty. We’re not able to "do our part" or to "do what lies within us" toward justification because, as a consequence of the fall, all that lies "within us" is sin and death. Therefore the first Reformation sola was "solely unable." This is the essential assumption behind sola gratia, the claim that justification is by grace alone. Grace, is no longer to be reckoned a sort of medicinal stuff with which we are injected, with which we cooperate toward eventual justification. Luther came to understand that grace is God’s attitude of favor toward sinners. Grace isn’t something with which we are infused. Rather, God is gracious toward us. He shows us favor. He gives to us what we do not deserve: righteousness and life. Only then did Luther realize, as he next lectured through Romans that it was only by the imputation of the righteousness of Christ that we are justified. The entire medieval system was about interior moral renewal. The Reformation is that the gospel is outside of us. The Gospel is that Christ has done it all for us. Justification is solely on the ground of imputed righteousness. During his next two sets of lectures in Galatians and Hebrews Luther gradually realized that the medieval definition of faith as "formed by love" (fides formata caritate) is false and a misreading of Gal 5. Faith doesn’t justify because it produces sanctity (holiness) in internal moral renewal. Faith justifies because it apprehends Christ and his obedience and death for us (pro nobis). This is solus Christus. Faith is an open, empty hand. Faith is a beggar. Faith looks outside of itself and one’s self to Christ. Faith has no power except Christ its object. Faith is receiving and resting on Christ and his finished work for sinners. Faith is a certain knowledge and a hearty trust in Christ and his gospel. That’s sola fide. With these breakthrough conclusions came others. During this period Luther came to a new hermeneutic. Where much of the patristic and all of the medieval church had read the Bible to contain two kinds of law, old and new, Luther came to see that the Bible had throughout two kinds of words: law (do) and gospel (done). The gospel is not: here is more grace so you can keep the law. The gospel is not: Christ will approve of you if you do your part. The gospel is: Christ has done it. This turn to the law/gospel hermeneutic was a foundation stone of the entire Reformation and it was adopted by all the Protestant churches and confessions Reformed and Lutheran. One of the great tragedies is that today there are congregations that will celebrate Reformation Day or who celebrate a nearby Reformation Sunday who will look you straight in the eye and tell you that the Reformed don’t use a law/gospel hermeneutic. So we are already in the thick of the time when we can start remembering the 500th anniversary of the great events leading up to the Reformation. We can and should work to understand the theological muddle that the medieval church had become, and we can and should look not only to Luther's work, but to the work of Wycliffe, Huss, Zwingli, and all of the many others who stood firmly on the Truth, in spite of threats to their lives. In doing so, they really did create a turning point in modern history. We are the heirs of that effort. The Grandverbalizer19 does lots of verbalizing . . .
. . . and lives up to his name! The Grandverbalizer19’s response to Part 1 was another typical response – But I am grateful for him allowing my three responses in his comboxes. Honestly, this seems like another Ahmad Deedat/Zakir Naik method - "throw every argument out there at him, including the kitchen sink!" It is clear that the Grandverbalizer19 took all the verses of the NT that he cited out of context. I showed this clearly. My focus was on how he took the NT verses out of context each time. GV19 spent most of his response on many other things, except the issue of taking verses out of context. He clearly took all the verses out of context; but when we quote Surah 9, we are not taking it out of historical context, since it was the last or next to the last Surah revealed, at the time when Muhammad was commanded to fight all and spread Islam (lots of verses in the Hadith to back this up); and the results were they conquered Mesopotamia (today’s Iraq, at the time part of the Persian Empire), the rest of Persia, the Middle East (Syria, Palestine, Lebanon), Egypt, North Africa, Spain – all by aggressive war. They had no legitimate right to do that. But that seems to be what Islam really was – the whole major context of Islam from Medina (622 AD) on is battles, fighting, Jihad, Qatal (to fight to the death, to kill, to slay), etc. The bottom line is that the aggressive war texts in the Bible are all in the OT, and so were only for the nation of Israel at that time, under the old covenant; and these are abrogated by the NT (Hebrews 8:13; Matthew 21:43 ( Jesus took the kingdom of God away from Israel); John 18:36; Matthew 26:52; Ephesians 6:12), yet the aggressive war texts in the Qur’an and Hadith come at the end of Muhammad’s career; and they are all still in force for Muslims and have been throughout Islamic history; and they provide the texts and argumentation of all Jihadist movements of the 20th century and Islamic governments that institute Islamic law. Romans 13:1-8 is for the secular state government; not for the church. At the time Romans was written (57 AD), it was the Roman Empire under cruel and barbaric Caesars such as Caligula, Claudius, and Nero; the Roman Empire persecuted Christians for over 300 years. Remember that, my friend Grandverbalizer19! Christianity grew under persecution; Islam did not. Christianity was not political; Islam is inherently political; Christianity did not commit aggressive wars in its texts, nor in its earliest history; Islam, by contrast was dominated by war contexts and situations. Focus on Surah 9 - it is all out aggressive war against the pagans in Mecca in verse 5; and it is open ended warfare against “the people of book” (Ahl Al Kitab اهل الکتاب ) in 9:29 until they are subdued and humiliated, having to pay the Jizye tax and reduced to dhimmi status; and this is exactly what the followers of Muhammad did when over the next several centuries, conquered all the lands east and west of the Arabian peninsula. Context in the Qur’an? There is not much context! There is some, but not much in the Qur’an itself. One has to go to the Hadith (Traditions)and Tafsirs(commentaries), and Tarikh (History) and Sirat (Life of Muhammad) for that. Except for the first Surah, the Opening prayer, (فاتحه ) , Surahs are arranged by size, not by chronology. And most Muslim scholars agree that Surah 9, Repentence is the last one revealed, or next to the last – some believe Surah 5 Al Maida was the last one revealed, while some believe that Surah 110 was the last. Imam Al Bukhari says that Surah 9, Repentance ( ال توبه) or the Immunity ( Bara’a بَرَاءَةٌ) is the last one revealed. (Hadith Sahih Al Bukhari , volume 6, book 60, no. 129). Al Bukhari’s collection of traditions is the most respected Hadith collection by all Sunni Muslims. There is no getting around this. “Sahih” means “correct”, “right”, “true”, “genuine”. We can clearly see that aggressive warfare against all was the final stage of Jihad/Qatal in Muhammad’s career. In the Meccan period of Surahs, revealed from 610-622 AD, it was peace and tolerance and he was persecuted by the pagan Arabs in Mecca who wanted to hold on to the Kaaba as a house of 360 idols. Later in Medina (622-632 AD), Muhammad got new revelations to attack the caravans, and fight in self-defense, and then last, he got the revelation to attack aggressively to spread Islam. I don’t see how the Muslim can escape this fact, both in all the Islamic texts and the history of Islam after Muhammad died in 632 AD. Surah 9:29 and the historical background of Muhammad preparing to attack the Byzantine Empire for the battle of Tabuk; and the whole history of the Arabs conquering Palestine, Syria, Lebanon, Egypt, N. Africa, Spain, Persia, and seeking to conquer Constantinople is clear that Surah 9:29 was open ended, being one of the last Surahs and verses revealed to Muhammad. The Muslims after Muhammad died were fully carrying out his example and commands. I just don’t see how Muslims can avoid this fact, when you look at all the relevant information. To be fair, Islamic jurisprudence ( fiq) does say that only a recognized Islamic leader can call for Jihad/ Qatal. Certainly Muhammad and his successors (Khalifs) are legitimate Islamic leaders who can call for war against the pagans and Christians and Jews and Zoroastrians; and later against Hindus and Buddhists. All of the centuries from Muhammad’s time until 1924, there was a Khalif (Islamic leader; deputy on earth, successor to the prophet). Ataturk, the secular leader of the modern country of Turkey, abolished the Khalifate in 1924. The united Islamic Umma (The Community of all Muslims under one nation) under the Ottoman Empire had been shrinking for a long time. The Ottoman Empire was defeated and broken after World War I, and the modern Muslim countries emerged. Modern Jihad movements today see themselves as seeking to return to the war/Jihad/Qatal of the earlier Muslim periods; and they are also calling for the re-establishment of the Khalifate. This article confirms this, quoting the Muslim scholars and Tafsirs themselves on the principle of abrogation. All the relevant information is there. It is clear. Allah's Apostle said: "I have been ordered (by Allah) to fight against the people until they testify that none has the right to be worshiped but Allah and that Muhammad is Allah's Apostle, and offer the prayers perfectly and give the obligatory charity, so if they perform a that, then they save their lives an property from me except for Islamic laws and then their reckoning (accounts) will be done by Allah." The Grandverbalizer19 quoted from 2:190-193 of the Qur’an. Yes, 190-192 gives more context and it says to only attack if they attack first. Ok, but that was the second stage of the revelation of Jihad/Qatal (fighting, killing, slaying). I am sorry, but this word does not mean "persecution" at all! It means "rebellion", "mutiny", "treason", "confusion", "sedition", "revolt", "calamity". Anything, any questioning or disobedience against Islam or Islamic morals or behavior is interpreted as "rebellion" against the Islamic state, and that is why they fanned out in aggressive war for centuries until they were stopped by Charles Martel in 732 AD at the Battle of Tours; and in Vienna in the 1500s, etc. Everything in the west can be interpreted by the Muslims as "fitneh" - capitalism, banks, women's rights, clothing, advertisement, freedom of speech, freedom of religion, democracy, art, media, music, Christian evangelism, etc. ; since they do not conform to Islamic law. Grandverbalizer19, I wish you the true peace of God, which is found only in Isa Al Masih (Jesus the Messiah), which He offers you – Matthew 11:28-30; John 14:27; Romans 5:1-11. In order to have true peace, you must first realize that you are a sinner and rebellious and not good and you are, (all of us, myself included, are sinners, until Christ saves us) making "war" (rebellion in sin) in your heart against God. Until you see your sinful heart, you will not understand nor believe. 20And He [Jesus Al Masih] was saying, "That which proceeds out of the man, that is what defiles the man. 22deeds of coveting and wickedness, as well as deceit, sensuality, envy, slander, pride and foolishness. 23"All these evil things proceed from within and defile the man." Most all evangelism, discussion, debate and argumentation with Muslims eventually gets into politics and military / war issues, because that is the nature of Islam, it is inherently political and militaristic; and that is what many Muslims love to bring up. Muslims like to bring up certain OT texts and punishments in the law of Moses; and the Muslim likes to mix different contexts for different verses and they also like to quote American conservative political figures and TV preachers who go over-board in their patriotic zeal for self defense and some kind of just-war principle. A Muslim who calls himself, “The Grandverbalizer19” has done just that, mixing statements of conservative Christians and political commentators with bunches of verses, both OT and NT, taken out of context. The Grandverbalizer19 and I had a peaceful, good discussion/informal debate, where I sought to preach the gospel as much as possible, at David Waltz’ blog recently, the comboxes up to 249 comments. He has yet to answer everything. But, that is not the subject of this post. I hope to someday organize some of that discussion for other posts. I want to focus on his “Franklin Graham” post and the way he mis-handled the Bible in these series of posts of mine. I want to deal with his bad handling of Bible verses first, then say something about the political statements of conservative Christians last. This will probably be divided up into several posts over different days. Where do these Christian dominionist and far right Christian extremist like Franklin Graham, Sarah Palin and Rod Parsley get the idea that violence is o.k and it solves things? Well they get their ideas from Jesus of course! The GV19 then quoted Matthew 10:34. In Matthew 10, please read verses 24-39 to get the whole context and meaning, especially verses 32-33 and 35-36, the surrounding immediate context. This verse has never been legitimately used for self defense or just war. It cannot be used with legitimate exegesis and hermeneutics at all by Christians to justify self-defense or just war. That is not what the verse is about. Read the context. “Sword” is a metaphor here for “conflict” and “tension” and “fighting” – when one family member comes to know Christ as Savior and Lord, the others in the family don’t like it and it creates tension, disagreements, fights, and persecution. Fathers disowned their children because of the children’s faith; and vise-versa. It is the same tension in the Muslim world. If children of a Muslim family become Christians, the parents and uncles, etc. get upset and there is conflict and tension, many times persecution and sometimes the Muslims do honor killings in defending the honor of Islam. Isn’t this a fact? Another example of taking a verse out of its context. Read verses 25-35 – it is about the requirements for discipleship – being a follower of Jesus. He does not mean one must have an emotional hatred toward his parents or wife or children – He just means that Christ comes first and when this loyalty is tested, it will seem like to the others that this true believer “hates” me, because his or her loyalty to Christ is above loyalty to parents or wife, etc. Since the Scriptures also teach “honor your father and mother” (Exodus 20; Deuteronomy 5; Ephesians 6:1-2) and “love your wife as Christ loved the Church” (Ephesians 5:25), it cannot mean what you trying to make it mean. See also the parallel passage in Matthew 10:37. The word, “hate” in Luke 14:25 means “by comparison of his love for Me”; or “to love Christ so much more than others than when a conflict of loves happens, it seems like the disciple of Jesus hates us” (mother, father, child, or wife). Another example of Ahmad Deedat /Zakir Naik style argumentation. GV19, you know better than that; as is evidenced by some other things all over your blog that are much more balanced and honest. Sometimes you are fair, and reasonable; (and sometimes not), but this post is full of just completely wrong argumentation. This is another example of the GV19 taking a verse out of context. Please go back to verse 11 – what is this literary genre ? Oh! A parable! Parables are stories full of metaphors to teach a spiritual lesson. So this is not a command like in Sharia Islamic law, as in the Hadith, “whoever leaves Islam, kill him”. No; Luke 19:27 is not like Islamic Sharia law. The verse in Luke; it is the end of a parable, a lesson about the time between now and the Second Coming of Christ. Verse 13 – “Do business, until I come back.” At His Second Coming, and judgment day, Christ will judge and punish all who did not want to submit to Him as Lord, yes. You believe in heaven and hell also and in judgment day; and that is God’s right. That is far different than promoting force and aggressive war now on earth; and harsh punishments for apostasy, carried out by the state or by honor killings, as in Islamic cultures. Revelation 19:11-21; 20:10-15; Matthew 5:21-30 – Hell is horrible and forever – Mark 9:48 – “where the worm does not die and the fire is not quenched” – and hell is not where Satan rules, as many mistakenly think, but the presence of the holy justice of God against sin – Revelation 14:10 – Unbelievers are punished and tormented forever in the presence of the Lamb (Jesus) and his holy angels. (see also John 3:18; 3:36; Romans 1:18; Ephesians 2:1-3; Matthew 25; 2 Thessalonians chapter 1) The wrath of God is painful – Luke 19:27 is a metaphor of the wrath of God coming at the judgment day. This has nothing to do with any kind of punishment here and now on earth. The Church cannot and should not physically punish anyone who does not submit to Christ. The church can ex-communicate them out of the church, but it cannot physically punish. And the government should not punish anyone either for religious reasons. You know the history of western civilization. Learn to do proper exegesis of the Bible, studying the context and author’s intended meaning and historical background and harmonizing with the rest of Scripture. Luther's Hard Work Proves Mental Instability? I'm appreciative when someone does the work for me, even if that work was done sixty-five years ago. 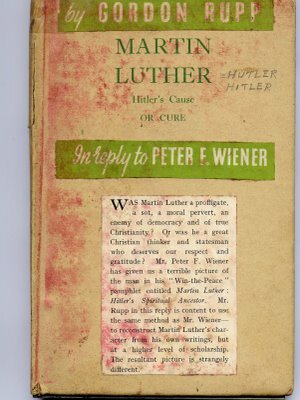 The following is a snippet from Peter F. Wiener's Martin Luther: Hitler's Spiritual Ancestor , followed up by a counter response from Gordon Rupp's book, Martin Luther: Hitler's Cause or Cure? In Reply to Peter F. Wiener (London: Lutterworth Press, 1945) p. 18. Complete mental instability remained the keyword to his life. He tried to overcome his depressions by overwork or too much prayer, always overdoing things, with the result that his mental state deteriorated. There are many passages in his own writings which give us a good insight into Luther's psychological processes. Here is where he is overworking himself. “I need two secretaries. I do practically nothing all day long but write letters. . . . I am Preacher of the Convent and the Refectory; and vicar in the district, and therefore elevenfold Prior; I am responsible for the fish-ponds at Leitzkau; I am agent at Torgau in the suit for Herzberg parish church; I give lectures on St. Paul, I am collecting notes on the Psalter. I rarely have time to recite my Office and say Mass.” “Physically I am fairly well, but I suffer in spirit,” he would confess. “For more than the whole of last week I was tossed about in death and hell, so that I still tremble all over my body and am exhausted. Billows and tempests of despair and blasphemy assailed me and I had lost Christ almost entirely” (Luther's Letters, Enders Edition, vol. 1, pp. 66, 67, and vol. 6, page 71). At other times he does nothing at all. “I am here in idleness,” he writes in 1521, “alas neglecting prayer and not sighing once for the Church of God. I burn with all the desires of my unconquered flesh. It is the ardour of the spirit that I ought to feel. But it is the flesh, desire, laziness, idleness and sleepiness that possess me” (ibid. vol. 3, page 189). 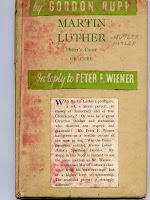 To the assertion made by many writers of varied and vested mental interests, that Luther was mentally unbalanced, Mr. Wiener adds not a jot of evidence, but a novel device. Hitherto, Luther's prodigious labours and enormous and sustained literary output have told against the charge of madness, but now these things become the neurotic symptom of " overwork " (p. 24). To his dubious anecdotes Mr. Wiener adds ingenious proof. He gives a quotation showing the Reformer working at tremendous pressure, and follows that with two quotations in which Luther sits in idleness. There the man goes, we think, overworking one minute and brooding the next. What an unstable fellow! And now, let us look at Mr. Wiener's conjuring trick more closely. The first quotation is Luther's description of his many monastic duties, written in 1516 (p. 24). Mr. Wiener knows how to drop a quotation in mid-sentence, and like a hot brick, when it begins to turn on him, and so he does not finish the sentence with "to say nothing of my own temptations from the world, the flesh and the devil. See what a lazy man I am." Then follow the quotations about Luther's idleness. The first is from a letter written in August 1527 when the Reformer was recovering from a dangerous illness which had left him exhausted. The second is from the period (1521) of Luther's enforced hiding in the Wartburg, written during a sharp and painful illness. In fact, in this very letter he confesses that unless some relief comes he must seek a physician (at grave risk of public discovery). We shall consider later the wonderful uses to which Mr. Wiener puts this quotation. Luther was busy in 1516, and in 1527 and 1521 he was idle—because he was ill! What a proof! Is there any moderately busy man alive of whom such assertions could not be made? 2 Grisar, Vol. V, 333; VI, 103. 3.Luther to Melancthon, July 13, 1521, W.E. Letters, 2, pp. 356-59. How Accurate was Exsurge Domine in Refuting Martin Luther? Over on the Catholic Answers Apologetics forum, the question was recently asked, "Which of the 95 does Rome disagree with today?" Now if you've never read the Ninety Five Theses, you're in for a tough read. It isn't a document that makes a whole lot of sense if you're not familiar with the historical and theological background of the controversy between Luther and the Roman church. But don't worry, I'm going to explain why you're not alone if you're not sure what was going on in the Ninety Five Theses or what exactly Luther was saying at the time that so infuriated Rome. It appears Rome wasn't sure either what exactly Luther was saying in some instances. The Roman Church issued a document explaining why they rejected Luther's teaching: Exsurge Domine, and this was noted by the Catholic Answers participants: "But there is the original rebuttal made on June 15, 1520 by Pope Leo X. This was a papal encyclical entitled Exsurge Domine. This document outlined the Magisterium of the Catholic Church's findings of where Luther had erred." And another comment: "Why not read Exsurge Domine (Arise, O Lord), which was the Vatican's official response to the Ninety-Five Theses and other writing of Luther. It specifically demanded that Luther retract some 41 specific errors. Some of them were from the Ninety-Five Theses, some were not. It does not, however, break the Ninety-Five Theses down point-by-point." As a legal document Exsurge Domine presumed the theological refutations provided by Prierias, Cajetan, and, most demonstrably, Eck. The brief denunciations and an incomplete statement of Luther's teachings provide little opportunity for determining the finer points of magisterial objections to the reformer (Hillerbrand 1969, 108-112). The document contains no hierarchy of condemnation, never distinguishing which of the forty-one errors are heretical doctrinally and which are merely "offensive to pious ears" [Gregory Sobolewski, Martin Luther Roman Catholic Prophet (Milwaukee: Marquette University Press, 2001), pp. 67-68]. Now digest the weight of this statement. It claims Exsurge Domine "contains no hierarchy of condemnation," and "never distinguishing which of the forty-one errors are heretical doctrinally and which are merely "offensive to pious ears." "There is agreement among most Reformation scholars that the Bull Exsurge Domine of June 15, 1520, which threatened Martin Luther with excommunication, constitutes a strange document and an evasive assessment of Luther's theological concerns." "An additional weakness of the document was that it refrained from identifying the specific censures for the forty-one propositions." Proposition 25, which pertains to the primacy of the Roman pontiff, cannot be located in any of Luther's writings prior to 1520. Proposition 4...took two of the 95 Theses (Thesis 14, "Imperfecta ... magnum timorem," and Thesis 15, "Hie timor et horror satis est se solo... faceré poenam purgatorii"), and added, as a final clause, a passage from the Resolutions which read "horror ipse mortis... etiam se solo impedit introitum regni. "7 It would seem that the "new" sentence does not precisely agree with Luther's own formulations. Proposition 5 confined itself to a quotation of the opinion of others. Proposition 33...forged one sentence out of two disjointed ones in Luther. Again, the quotation overlooked that Luther expressly referred to St. Jerome as guide for his own view. In proposition 30 Luther was incorrectly quoted. Proposition 37 changed Luther's "quod in universa scriptura non habeatur memoria purgatorii" into "purgatorium non potest probari ex sacra Scriptura. "18 Again, one must take note of a divergence in meaning, if Luther's sense is taken to be that the word "purgatory" does not occur in Scripture. Proposition 41, which rejected Luther's notion that the authorities "non male facerent, si omnes saceos mendicitatis delerent," was evidently understood as an attack upon the mendicant orders, but was in Luther a social concern that had to do with begging as such. In sum, no less than twelve of the forty-one propositions did not accurately quote Luther or cannot be taken to express his sentiment. While this leaves the majority of the propositions still intact, this fact does introduce a note of uncertainty. Any consideration of the Bull Exsurge Domine raises varied and far-reaching questions that go beyond the modest scope of what was attempted here: Are the 41 condemned propositions a fair summary of Luther's teaching? If so, was his thought truly incompatible with the norms of the Catholic Church? We have already cited the scholarly consensus which answers this question negatively, if for no other reason than that the theologically weightier pronouncements on the part of Luther came only after 1520. By the way, before someone points a finger at Hillerbrand, note that he was a partial editor / translator for Exsurge Domine for that version used on the Papal Encyclicals website, and linked to by the Catholic Answers participants: "Webmaster comment: This added text in italics was obtained from a secondary source, translator Hans J. Hillerbrand, ed. "The Reformation in its own Words" (London: SCM Press Ltd., 1964), pp80-84." Recently I was part of a short discussion over on the Catholic Answers Apologetics forum. I wish I could link over to it , but the moderators pulled the entire thing. I'm not sure why, but I doubt it was anything I wrote. A zealous Romanist posted a thread entitled, "The Real Luther." He was smitten by a footnote from Robert Sungenis on page 129 of Surprised By Truth (California: Basilica Press, 1994). Now, if you engage Roman Catholic apologetics, this is a volume you should pick up and at least be familiar with. 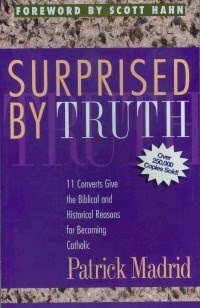 It has the "conversion" stories of some of the big name pop-Roman Catholic apologists. The book is one of their main tools in "witnessing" for the sect of Romanism. You'll get a feel for why the conversion story is one of their key tools. In order to substantiate his claims that man was justified by faith alone, Luther deliberately added the word "alone" to his German translation of Romans 3:28. In reality, the only time "alone" appears with the word "faith" in the Greek text is in James 2:24 where it says we are "not saved by faith alone." Luther defended his novel addition bragging, "You tell me what a great fuss the Papists are making because the word 'alone' is not in the text of Paul. If your Papist makes such an unnecessary row about the word 'alone,' say right out to him: 'Dr. Martin Luther will have it so,' and say: 'Papists and asses are one and the same thing.' I will have it so, and I order it to be so, and my will is reason enough. I know very well that the word 'alone' is not in the Latin or the Greek text, and it was not necessary for the Papists to teach me that. It is true those letters are not in it, which letters the jackasses look at, as a cow stares at a new gate ... It shall remain in my New Testament, and if all the Popish donkeys were to get mad and beside themselves, they will not get it out." Cited in John Stoddard, Rebuilding a Lost Faith, (Rockford, IL TAN Books), 136-137. [Surprised By Truth (California: Basilica Press, 1994), p.129]. As a proof of the arbitrary spirit which Luther showed in making his translation of the Bible, we have the fact that he confessed to have added, for dogmatic reasons, the word "alone" to the text of St. Paul (Rom. iii. 28):—"Therefore we conclude that a man is justified by faith without the deeds of the law." Luther rendered the passage "by faith alone"; and when reproached for this, he wrote:—"You tell me what a great fuss the Papists are making because the word 'alone' is not in the text of Paul. If your Papist makes such an unnecessary row about the word 'alone,' say right out to him:—'Dr. Martin Luther will have it so,' and say:—'Papists and asses are one and the same thing.' / will have it so, and I order it to be so, and my will is reason enough. I know very well that the word 'alone' is not in the Latin and Greek text, and it was not necessary for the Papists to teach me that. It is true, those letters are not in it, which letters the jackasses look at, as a cow stares at a new gate. ... It ['alone'] shall remain in my New Testament, and if all the Popish donkeys were to get mad and beside themselves, they will not get it out." There, therefore, it remains to the present time. We see one definite thing here, Robert Sungenis in 1994 didn't bother to look up the Luther citation cited by Stoddard. Now one can simply find the exact treatise in which Luther made these comments. I've done a full review of Luther's comments in context: Luther Added The Word "Alone" to Romans 3:28?. I'm not going to repeat all I said in that link, but suffice it to say, Luther gives far more argumentation than either Stoddard or Sungenis admits. Roman Catholics rarely read past Luther's angry comments towards his Papal critics. They discredited him as a doctor of theology, a degree he earned in a rather quick period of time, and his academic abilities were above most. Indeed, he had done the work necessary to be taken seriously. His critics criticized his German translation while at the same time stealing it for their own translation- this infuriated him, and rightly so. Those like Stoddard who used Luther's Open Letter On Translating against him really drop the ball in terms of context. Luther actually goes on to give an exegetical explanation of why he uses the word "alone" in Romans 3:28. For you and our people, however, I shall show why I used the [German equivalent of the] word sola — even though in Romans 3 it was not [the equivalent of] sola I used but solum or tantum. That is how closely those donkeys have looked at my text! Nevertheless I have used sola fides elsewhere; I want to use both solum and sola. I have always tried to translate in a pure and clear German. It has often happened that for three or four weeks we have searched and inquired about a single word, and sometimes we have not found it even then. In translating the book of Job, Master Philip, Aurogallus (6) and I have taken such pains that we have sometimes scarcely translated three lines in four days. Now that it has been translated into German and completed, all can read and criticize it. The reader can now run his eyes over three or four pages without stumbling once, never knowing what rocks and clods had once lain where he now travels as over a smoothly-planed board. We had to sweat and toil there before we got those boulders and clods out of the way, so that one could go along so nicely. The plowing goes well in a field that has been cleared. But nobody wants the task of digging out the rocks and stumps. There is no such thing as earning the world's thanks. Even God himself cannot earn thanks, not with the sun, nor with heaven and earth, nor even the death of his Son. The world simply is and remains as it is, in the devil's name, because it will not be anything else. I know very well that in Romans 3 the word solum is not in the Greek or Latin text — the papists did not have to teach me that. It is fact that the letters s-o-l-a are not there. And these blockheads stare at them like cows at a new gate, while at the same time they do not recognize that it conveys the sense of the text -- if the translation is to be clear and vigorous [klar und gewaltiglich], it belongs there. I wanted to speak German, not Latin or Greek, since it was German I had set about to speak in the translation. But it is the nature of our language that in speaking about two things, one which is affirmed, the other denied, we use the word allein [only] along with the word nicht [not] or kein [no]. For example, we say "the farmer brings allein grain and kein money"; or "No, I really have nicht money, but allein grain"; I have allein eaten and nicht yet drunk"; "Did you write it allein and nicht read it over?" There are countless cases like this in daily usage. In all these phrases, this is a German usage, even though it is not the Latin or Greek usage. It is the nature of the German language to add allein in order that nicht or kein may be clearer and more complete. To be sure, I can also say, "The farmer brings grain and kein money," but the words "kein money" do not sound as full and clear as if I were to say, "the farmer brings allein grain and kein money." Here the word allein helps the word kein so much that it becomes a completely clear German expression. We do not have to ask the literal Latin how we are to speak German, as these donkeys do. Rather we must ask the mother in the home, the children on the street, the common man in the marketplace. We must be guided by their language, by the way they speak, and do our translating accordingly. Then they will understand it and recognize that we are speaking German to them. "But," they say, "it has an objectionable tone, and people infer from it that they need not do any good works." Dear me, what are we to say? Is it not much more offensive when Paul himself, while not using the term "faith alone," spells it out even more bluntly, putting the finishing touches on it by saying "Without the works of the Law?" And in Galatians 1 (as well as in many other places) he says "not by works of the law." The expression "faith alone" may perhaps be glossed over somehow, but the phrase "without the works of the law" is so blunt, offensive, and scandalous that no amount of interpretation can help it. How much more might people learn from this that "they need not do any good works," when they hear this teaching about the works themselves stated in such a clear strong way: "No works", "without works", "not by works"! If it is not offensive to preach "without works," "not by works," "no works," why is it offensive to preach "by faith alone"? Still more offensive is that Paul does not reject just ordinary works, but works of the law! One could easily take offense at that all the more and say that the law is condemned and cursed before God, and so we should be doing nothing but what is against the law, as it is said in Romans 3: "Why not do evil so that there might be more good?" This is what one Rottengeist of our time began to do. (10) Should we reject Paul's word because of such "offense" or refrain from speaking freely about faith? Dear me, Saint Paul and I want to offend like this, for we preach so strongly against works and insist upon faith alone just so that people will be offended, stumble and fall, that they may learn that they are not saved by good works but only by Christ's death and resurrection. Knowing that they cannot be saved by their good works of the law, how much more will they realize that they shall not be saved by bad works, or without the law! Therefore, it does not follow that because good works do not help, bad works will; just as it does not follow that because the sun cannot help a blind man to see, the night and darkness must help him to see. I am amazed that anyone can object to something as evident as this. Just tell me: Is Christ's death and resurrection our work, that we do, or not? Of course it is not our work, nor is it the work of any law. Now it is Christ's death and resurrection alone which saves and frees us from sin, as Paul writes in Romans 4: "He died for our sins and rose for our justification." Tell me, further: What is the work by which we take hold of Christ's death and resurrection? It cannot be any external work, but only the eternal faith that is in the heart. Faith alone, indeed all alone, wihtout any works, takes hold of this death and resurrection when it is preached through the gospel. Then why all this ranting and raving, this making of heretics and burning them at the stake, when it is clear at its very core that faith alone takes hold of Christ's death and resurrection, without any works, and that his death and resurrection are our life and righteousness? As this fact is so obvious, that faith alone conveys, grasps, and imparts this life and righteousness — why should we not say so? It is not heretical to believe that faith alone lays hold on Christ and gives life; and yet it seems to be heresy if someone mentions it. Are they not insane, foolish and absurd? They will admit that it is right but they brand the telling of it as wrong, though nothing can be simultaneously right and wrong. Furthermore, I am not the only one, nor the first, to say that faith alone makes one righteous. There was Ambrose, Augustine and many others who said it before me. And if a man is going to read and understand St. Paul, he will have to say the same thing, and he can say nothing else. Paul's words are too strong — they allow no works, none at all! Now if it is not works, it must be faith alone. Oh what a fine, constructive and inoffensive teaching that would be, if men were taught that they can be saved by works as well as by faith. That would be like saying that it is not Christ's death alone that takes away our sin but that our works have something to do with it. Now that would be a fine way of honoring Christ's death, saying that it is helped by our works, and that whatever it does our works can also do — which amounts to saying that we are his equal in strength and goodness. This is the very devil's teaching, for he cannot stop abusing the blood of Christ. Therefore the matter itself, at its very core, requires us to say: "Faith alone justifies." The nature of the German language also teaches us to say it that way. In addition, I have the precedent of the holy fathers. The dangers confronting the people also compel it, for they cannot continue to hang onto works and wander away from faith, losing Christ, especially at this time when they have been so accustomed to works they have to be pulled away from them by force. It is for these reasons that it is not only right but also necessary to say it as plainly and forcefully as possible: "Faith alone saves without works!" I am only sorry I did not also add the words alle and aller, and say, "without any works of any laws." That would have stated it with the most perfect clarity. Therefore, it will remain in the New Testament, and though all the papal donkeys go stark raving mad they shall not take it away. Let this be enough for now. God willing, I shall have more to say about it in the treatise On Justification. Well, so much for 1994. Perhaps Madrid can revise Surprised By Truth, but then again, one wonders if a revision would still include the conversion story of Robert Sungenis. Ulrich Zwingli doesn't get as much coverage as some of his contemporaries. He wasn't as brilliant a writer as Luther, nor as great a theologian as Calvin. 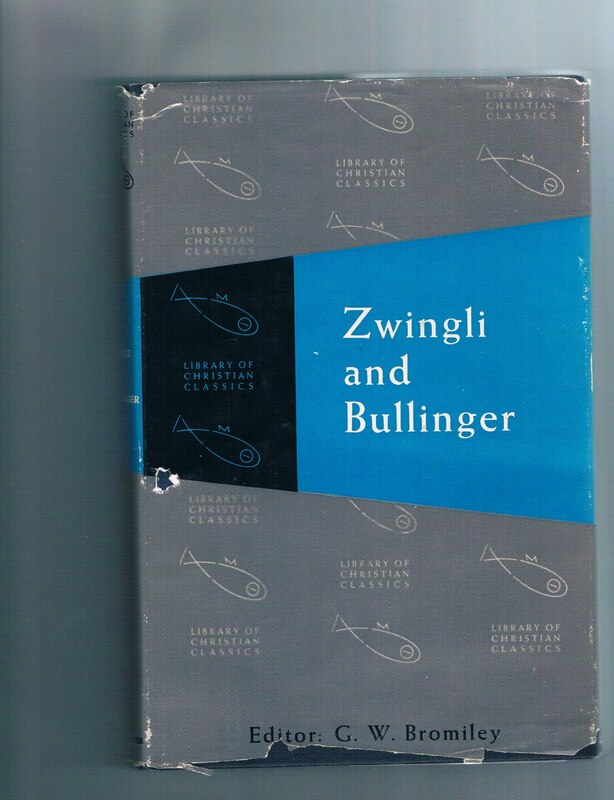 Up until the advent of Google books, it was actually difficult to track down a lot of Zwingli's writings. I had tracked down one or two books of small collections (in fact the book pictured is my copy), and even after reading them, I was never all that inspired to post or write much about anything he had written . Well, of course Luther said far worse about Zwingli, but I find it interesting that the particular gentleman who stated this is always ranting about Luther's alleged denial of good works or pursuit of holiness. In the same comment this Roman Catholic notes that Protestants use "slander, swill, sophistry and swinishness" so as to be faithful to Luther, and then a few lines later he calls Zwingli an idiot. So, whom is it exactly that isn't pursuing good works and holiness by using slander, swill, sophistry and swinishness? In this matter of baptism—if I may be pardoned for saying it- I can only conclude that all the doctors have been in error from the time of the apostles. This is a serious and weighty assertion, and I make it with such reluctance that had I not been compelled to do so by contentious spirits I would have preferred to keep silence and simply to teach the truth. But it will be seen that the assertion is a true one: for all the doctors have ascribed to the water a power which it does not have and the holy apostles did not teach. They have also misunderstood the saying of Christ about water and the Holy Ghost in John 3. Our present task is to see what baptism really is. At many points we shall have to tread a different path from that taken either by ancient or more modern writers or by our own contemporaries. We shall be guided not by our own caprice but by the Word of God. When he took upon himself the curse of the Law, Jesus Christ, the very Son of God, deprived us of all external justification. Therefore no external thing can make us pure or righteous. That means that everything ceremonial, all outward pomp and circumstance, is now abolished, as Paul says in Hebrews 9: "This figure was for the time then present, in which were offered both gifts and sacrifices that could not make him that did the service perfect as pertaining to the conscience; which stood only in meats and drinks, and divers washing, and carnal ordinances, imposed on them until the time of reformation" etc. This reformation was accomplished by Christ, as we see in the following passage: but it would take too long to speak of that now. These verses tell us, however, that Christ abolished external things, so that we are not to hope in them or to look to them for justification. Certainly we are not to ascribe cleansing to the external things which are still left For if in the Old Testament they were only carnal and outward, not being able to cleanse us or to give us peace or to assure the conscience, how much less are they able to accomplish anything in Christ, in whom it is the Spirit alone that quickeneth. Before treating of baptism we must first indicate the meaning of the word sacrament. In our native tongue the word suggests something that has power to take away sin and to make us holy. (7) But this is a serious perversion. For only Jesus Christ and no external thing can take away the sins of us Christians and make us holy. And as a result of this misunderstanding there are some who cry out: "They are depriving us of the holy sacraments whereby our poor souls are comforted." But we have no desire to take away the sacraments but simply to use them rightly and not to pervert them. And they are perverted by those who ascribe to them a virtue which they do not possess. As used in this context the word sacrament means a covenant sign or pledge. If a man sews on a white cross, he proclaims that he is a Confederate. (8) And if he makes the pilgrimage to Nahenfels and gives God praise and thanksgiving for the victory vouchsafed to our forefathers, (g) he testifies that he is a Confederate indeed. Similarly the man who receives the mark of baptism is the one who is resolved to hear what God says to him, to learn the divine precepts and to live his life in accordance with them. And the man who in the remembrance or Supper gives thanks to God in the congregation testifies to the fact that from the very heart he rejoices in the death of Christ and thanks him for it. Of those who complain I ask only this: that they let the sacraments be real sacraments and do not describe them, as signs which actually are the things which they signify. For if they are the things which they signify they are no longer signs: for sign and thing signified cannot be the same thing. (10) Sacramenta—as even the papists maintain—are simply the signs of holy things. Baptism is a sign which pledges us to the Lord Jesus Christ. The remembrance shows us that Chris suffered death for our sake. Of these holy things they are the signs and pledges. You will find ample proof of this if you consider the pledge of circumcision and the thanksgiving of the paschal lamb. Bon Voyage .... Envoy Forums? Ligon Duncan (main session # 7, the last video at the end) gives an excellent summary of how to approach Patristics and the early church fathers, keeping them accountable to the final sole infallible rule of faith - the Scriptures. This is part three of my review of Luther: The Rest of the Story By Ken Hensley (2003). 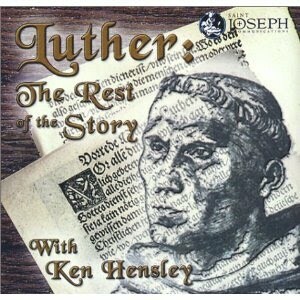 In three audio lectures, Mr. Hensley explains Luther from his particular Roman Catholic perspective. In this third installment, I'll be addressing some of Mr. Hensley's positions outlined previously. Ken's basic position is that Luther was a sensitive child beaten by his parents. This caused him to create a false understanding of God. These psychological factors provoked Luther to cause a horrific schism in the church and invent heretical doctrines. Hensley's approach is known as pyschohistory. This approach holds history can be understood by applying the science of psychoanalysis to a historical figure. History is more than simply “facts”- it is also the result of psychological forces that drive people to do what they do. The Reformation therefore was not God's Spirit working in the Church, it was the result of a man with deep psychological problems who was in the right place at the right time to cause a controversy which divided the church. One shouldn’t whip children too hard. My father once whipped me so severely that I ran away from him, and he was worried that he might not win me back again. [LW 54:157]. Some teachers are as cruel as hangmen. I was once beaten fifteen times before noon, without any fault of mine, because I was expected to decline and conjugate although I had not yet been taught this. [LW 54: 457]. These three quotes form the bedrock upon which Hensley bases his case. They are statements Luther did not write himself nor ever see, uttered when he was fifty years old. This doesn't automatically amount to a rejection of these statements as facts, but their validity should be corroborated with Luther's actual writings or other historical evidence. Hensley isn't alone in utilizing the Table Talk to prove his case. The same bedrock was used by Erik Erikson in his book, Young Man Luther (1958). It's hard to say if Hensley used this book as a direct source, or if he used someone else that used Erikson's arguments. Either way, it was Erikson who popularized these Table Talk quotes as proof of Luther's traumatic upbringing. Somewhere down the line, Hensley was the beneficiary of Erikson's analysis, whether he knew it or not. Erikson draws on a considerable number of dark hues belonging to Luther's later memories in order to paint his picture of the relationship of the young Martin to his parents. But he leaves aside many of the lighter colors that could brighten up the picture, painting in, instead, lots of black, which he derives from his knowledge of personal conflict. This, however, considerably oversimplifies the matter. It is far more difficult to sketch a realistic picture of Luther's childhood and youth, one that is faithful to the sources, than it is to draw such a crass one. The historian, grateful as he is for the interpretative aids he has received, will nevertheless not simply capitulate before the clinician's claim to "recognize major trends even where the facts are not -available," least of all when some facts are being overlooked and others added. [Heinrich Bornkamm, "Luther and His Father" in Childhood and Selfhood, p. 65]. Bornkamm is indeed correct. Those who attempt to create a picture of Luther's early years often cling to the "dark hues" at the expense of all the colors. This is exactly what Mr. Hensley did. Luther's parents are painted as excessively severe. In the above Table Talk quote, Luther states that the discipline inflicted by his parents was meant "heartily well." That is, despite mistakes, they had the best interest of their son in mind. They made sacrifices in order to send him to good schools and they followed their son's progress with pride. In regard to Luther's mother's beating drawing blood from the young boy, there is no evidence she meant to do so. Nor is there evidence she did this multiple times. Luther said she had good intentions, but that the punishment given was out of proportion to the offense. That is, had he actually stole something of value, he expected to have a stronger punishment. Note also in the Table Talk citation about Luther's father, again the recollection of Luther is one particular event. After Luther's father punished him severely, he went to great efforts to win back the boy. Bainton says the words "win me back again" used in the quote means that Luther's father "took the initiative to undo the hurt, to overcome the estrangement, alienation, or resentment, and to recover rapport" [Psychohistory and Religion, p. 35]. This would be a more literal rendering of the phrase from the German. There isn't any evidence that Luther's father was a brutal tyrant. There is evidence that Luther was severely punished one time by his father, and that same father sought intently to repair the damage. No, Hans Luther was not harsh, drunken, or tyrannous, but rather tender and pious as well as stern and ambitious for himself and his son. Hans was inclined to be tender and deeply moved by suffering. Luther on two different occasions recounts a story which illustrates the point: "My father was asked at Mansfeld by a certain neighbor to come and see him, for he was in mortal agony. Turning on his bed he showed him his posterior and said, `See, dear Luther, how they beat me!' at which Father was so shocked and so shaken by those reflections that he nearly died himself." On one occasion Hans took Martin into a wheat field to show him the grain ripe for harvest and told him how the heavenly Father cares for us. The same man who was merry and humorous when he had belted a few joked with his wife in bed. Luther relates that his sons respect him just as he respected his parents, for his father slept with his mother and joked with her just as Luther did with his wife, and they were nevertheless pious people, just like the patriarchs and prophets. Hans was a man of genuine piety and an active churchman. The Mansfeld relatives recounted that Luther's father prayer often and earnestly at the bedside of his children. He was badly shaken when in 1505 he lost two sons to the plague and reflected that he should perhaps willingly give Martin to the Lord for service as a monk. He had as a very close friend Jonas Cemmerer, a priest, and had priests and teachers as house guests on occasion. As one of the Vierherrn or councilmen he signed endowments for the church and served as a trustee for prebends. In 1497, the year in which Luther went away to Magdeburg to be with the Brethren of the Common Life, Hans, the priest Johann Ledener, and the Mansfeld citizens won a sixty-day indulgence from the bishop for all those who attender mass at the two altars of a Mansfeld church dedicated to George, Mary, and an assortment of saints [Psychohistory and Religion, pp. 73-74]. Hensley does point out that Luther loved his parents. On the other hand, Hensley says that his relationship with his parents and inability to please them led Luther to his false view of God. Luther viewed God as wrathful judge who could not be pleased. Here is a telling sign of misdiagnosis. If Luther's views of God and parents are mirrored, why is it that Luther loved his parents but (as Hensley says) Luther hated God? One would think Luther must've hated his parents as well, but the historical accounts simply don't bear this out. According to Hensley, it was the severe treatment inflicted on Luther by his parents that sent him into the monastery. As a testimony to this fact, he provides Luther's statement as noting the primary cause: "My parents kept me under very strict discipline, even to the point of making me timid. For the sake of a mere nut my mother beat me until the blood flowed. By such strict discipline they finally forced me into the monastery." "I for my part did not run into the monastery because I wanted to serve the devil [Luther is comparing the work ethic with the worship of the golden calf], but in order to gain heaven through my obedience, chastity, and poverty." WA 44: 782,; lines 10 ff (LW 8: 276) : "Against everyone's will I deserted my parents and relatives and rushed into a monastery, and donned a cowl, because I was persuaded that with that kind of life and those severe hardships I was showing great allegiance to God." WA 49: 713, lines 6 ff: "I became a monk because I wanted to propitiate the strict Judge with my works." WATR 4, no. 4414: 303, lines 15 if (LW 54: 338) "I took the vow not for the sake of my belly but for the sake of my salvation, and I observed all our statutes very strictly." WA 37: 661, lines 22 ff: "I always thought, when will you finally get pious and do enough that you will obtain a gracious God? By such thoughts was I driven to monkhood." According to Scheel, Martin Luther, 1: 313, who cites a transcript (WA 37: 274, lines 14 ff), this frequently quoted passage belongs to the period in the monastery and not the time before. But in terms of its content this passage certainly also indicates why Luther entered the monastery. 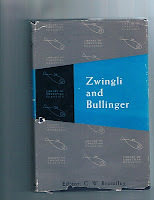 Further references are found in Scheel, Dokumente zu Luthers Entwicklung, and in the index volume WA 58, no. 1 [Heinrich Bornkamm, "Luther and His Father" in Childhood and Selfhood, p. 85]. Here we find multiple statements from Luther's own hand explaining his reasoning. These statements of course do not negate the Table Talk quote, but they should serve as primary evidence whereas a secondary statement from the Table Talk should take the back seat. Hensley though uses the Table Talk as his primary source. While Hensley would probably accept the above statements from Luther, his emphasis as to Luther's reason for entering the monastery has been attached to the wrong fact, based on a faulty presupposition of Luther's relationship with parents.